1. Elizabeth Farthing 2. Sarah Mary Stone (née Yetman, left) and Lily (Olivia) Yetman, (right) 3. Evelyn Mary Clack (née Farthing) 4. 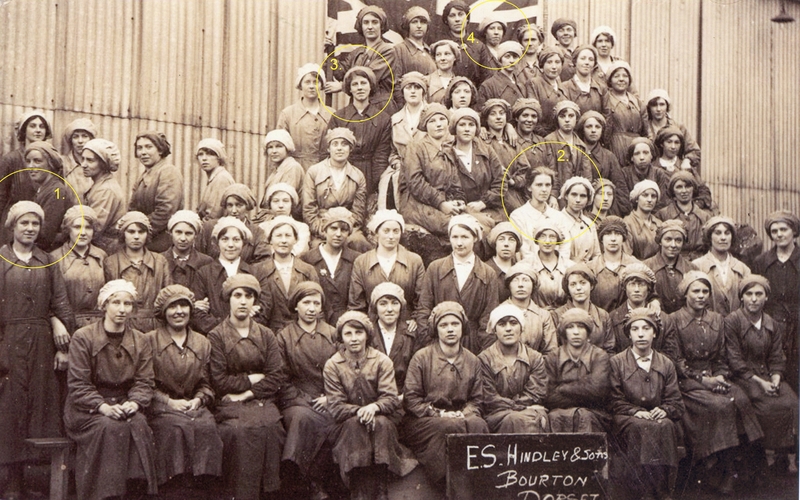 Esther Agnes Farthing, with fellow munitions workers at E.S Hindley and Sons, Bourton. The Wiltshire Does its Bit exhibition contains the story of the three Farthing sisters working at E.S. Hindley and Sons, the munitions factory at Bourton, on the Wiltshire/Dorset border near Mere, during the war. The three Farthing sisters identified in this image at E.S. Hindley and Sons, were the daughters of my great-grandparents Matthias and Theresa Farthing, who brought twelve children into the family home at Gasper between the years 1889 and 1903 (five boys and seven girls). My grandfather Alban Clack was a Grenadier Guardsman on the reserve list when he married my grandmother Evelyn Mary Farthing in St. Benedict’s Roman Catholic Chapel at Bonham in 1909. Returning to the family home in Warwick the couple had three children, the first born being my mother Josephine Evelyn. By 1915 Field-Marshal Lord Kitchener (Secretary of State for War) had decided there was an immediate need to raise a new regiment of Welsh Guards. The task or raising such an army was immense and one which meant recruiting some experienced officers and men from the three old regiments of Foot Guards, Grenadiers, Coldstream and Scots. Granddad Clack was thirty-two years of age when he was called up from the reserve list to serve as a Corporal with the newly formed 1st Battalion of the Welsh Guards. With their training complete, the battalion left for France in August 1915, but within the month Alban was to be wounded in action his injuries severe enough to cause his evacuation back to England and hospitalisation. March 1918. The situation in France was becoming so desperate they were calling on all reserves encamped on British soil to be sent to the front. It had been twenty-nine months since Alban had been wounded at the ‘Battle of Loos’, but despite his injuries this thirty-six year old Corporal was deemed fit to return to the front line. Sadly Alban was killed in action near Arras on 3rd September 1918, his remains taken to a cemetery on the Queant Road near Buissy in France. With her husband away with the Welsh Guards in France, Evelyn decided to leave Warwick with her children and return to Gaspar to live with her parents, hence taking up employment with her sisters, at Hindley & Sons at Bourton, thereby supporting the war effort and providing those vital munitions for their loved ones in France. A memorial headstone in the Angel Lane Cemetery at Mere bears the name of Alban Clack and his beloved wife Evelyn Mary, who passed away at The Milestone in Castle Street on 3rd June 1949. Two sisters names Sarah Mary Stone (née Yetman) and Lily Yetman have also been identified in the Hindley and Sons photograph above, (this time by Michael Yetman), they are the daughters of Samuel Yeatman, who worked at the foundry for 40 years from 1875-1915. If you recognise anybody in the photographs that are in the exhibitions or on the website, do not hesitate to contact us.